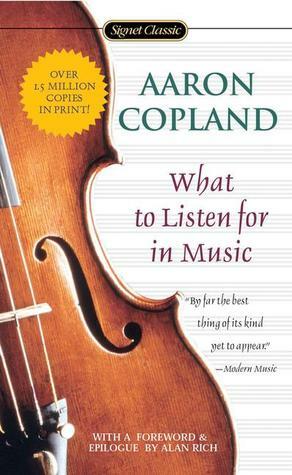 Venerable twentieth-century American composer Aaron Copland’s What to Listen for in Music has been on my bookshelves for a few years now. I hesitated for so long because I had mixed feelings about reading it: curious for the historical aspect of it, and a pang of dread because I was afraid it would be like sitting through old music theory courses. Turned out both my feelings were justified. Full disclosure: I am a professionally trained musician (bachelor and master’s degrees in composition, double bassist for more than fifteen years), so I realize this book isn’t really intended for a person like me. But from a historical standpoint, I do appreciate this set of lessons. Most of it was a nice little refresher for me. Everything is educational from a technical standpoint, and it was interesting to read a composition giant’s musings, however opinionated and dated (can’t say I agree with Copland that the double bass isn’t used as a solo instrument! and he is very vocal about which composers he thinks are best in various eras and styles). I think Copland articulated very well the act of listening to music on different “planes”: sensuous (for pure pleasure), expressive (composer’s meaning), and “sheerly musical” (acoustic/structural elements). I enjoyed his chapter on the craft of composing—all the different methods and processes. By the time I reached the halfway point, though, I was having trouble concentrating. I slogged through the second half. Copland’s writing style is quite dry and dense, and can be boring. I began wondering whether a non-musician would find this enjoyable (or understandable) at all. The edition I read has a great list of recording examples, but no accompanying CD (would be awesome in a reissue of the book, someday). Readers of What to Listen for in Music would probably need at least rudimentary knowledge before digging in, as there are several notated examples in the book, too (meaning: a standard staff with treble clef, bass clef, notes, rhythms, etc.). Someone who hasn’t had at least one piano (or other musical) lesson would have no grasp of these examples. Copland also limits discussion of interpretation in the book—there really isn’t much expansion on the “sensuous” and “expressive” listening planes he mentions in the beginning. Also—major, major point—this might have been more appropriately titled What to Listen for in Classical Music, for there is hardly anything more than a brief passing mention of jazz or any other styles. While a totally logical breakdown of the technical aspects one can find in classical music—and an amateur or non-musician could certainly find reading What to Listen for in Music educational—I think I was I expecting more enlightened insight into listening as an activity rather than straight-up theory lectures. This would have been a great read for my senior year in high school (knowing I was continuing at a music conservatory the next year) or as a freshman in music theory class. I think I might have to try Leonard Bernstein’s The Joy of Music in the future. What to Listen for in Music was my first read of twelve books total for the 2013 TBR Pile Challenge, hosted by Adam at Roof Beam Reader. Read from January 5 to 6, 2013. This entry was posted in books and tagged 2013 tbr pile challenge, history, music, reference by kristin @ my little heart melodies. Bookmark the permalink. Thanks! I’m rotating between the TBR Pile Challenge and the Eclectic Reader Challenge, while sneaking in some for my local library’s challenge too. Your “Where are you reading?” looked good, but I had already picked these ones, so maybe next year!